and thought what better way than a giveaway. 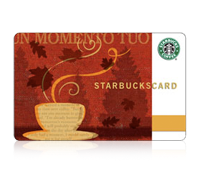 So who wants to win a $5 gift card to Starbucks? Just in time for fall drinks to be coming out soon. This is such an easy giveaway. All you have to do is 'like' me on Facebook. Did I read Starbucks Giveaway? I'm there! I'm liking your facebook now.